Get on the Job Faster! 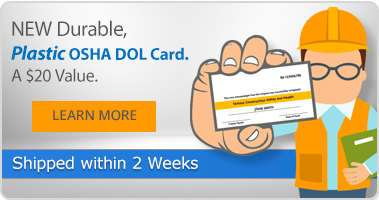 All Course Completions Now Come with a Durable, Plastic DOL Wallet Card. Shipped within 2 Weeks! OSHA 10 and 30 training are the training courses for workers, employers, and supervisors covered in 10-hour and 30-hour duration respectively. The training includes guidelines to recognize, abate, avoid, and prevent safety and health hazards at worksites through record keeping, proper material and machine handling, industrial hygiene, fall protection, and ergonomics. DOL Card Shipped Within 2 Weeks. In addition to learning about safety and health hazards in the workplace, students will also learn about OSHA, employer responsibilities, and worker rights. OSHA recommends Outreach Training Program courses as an orientation to occupational safety and health for workers to reduce injuries and save lives. 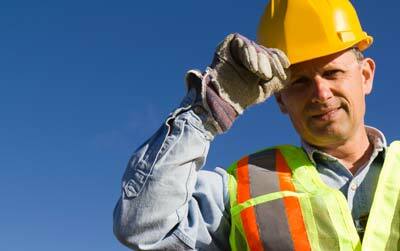 Workers must receive additional site specific training where required by OSHA standards. OSHA 30 Hour General Industry Outreach Training course is a comprehensive safety program designed for anyone involved in general industry. Specifically devised for safety directors, foremen, and field supervisors; the program provides complete information on OSHA compliance issues. OSHA recommends Outreach Training Programs as an orientation to occupational safety and health for workers covered by OSHA 29 CFR 1910. General Industry workers must receive additional training, when required by OSHA standards, on specific hazards of the job. The 30 hr General Industry Outreach Course is NOT equivalent to the OSHA 510 or 511 courses and will not meet the course prerequisites to take the OSHA 500 or OSHA 501 courses. The 10-hour General Industry Outreach Training Program is intended to provide an entry level general industry worker's broad awareness on recognizing and preventing hazards on a general industry site. Students will be introduced to OSHA policies, procedures and standards as well as general industry safety and health principles and work practices covered in OSHA Act Part 1910. Special emphasis will be placed on areas most hazardous using OSHA standards as a guide. General industry workers must receive additional training, when required by OSHA standards, on specific hazards of the job. The OSHA 30 Hour Construction Industry Outreach Training course is a comprehensive safety program designed for anyone involved in the construction industry. Specifically devised for safety directors, foremen, and field supervisors; the program provides complete information on OSHA compliance issues. OSHA recommends Outreach Training Programs as an orientation to occupational safety and health for workers covered by OSHA 29 CFR 1926. Construction workers must receive additional training, when required by OSHA standards, on specific hazards of the job. The 30 Hour Construction Outreach course is NOT equivalent to the OSHA 510 or 511 courses and will not meet the course prerequisites to take the OSHA 500 or 501 courses. You will find supplementary materials available for download by clicking the "Materials" tab on the menu located within the course player. Other reference materials are available from the OSHA website; please visit http://www.osha.gov/dte/outreach/.